It's All In St. Louis! Enjoy all of our hotel locations. When visiting St. Louis, there is no better place to stay than one of our hotels. . Whether you're here for pleasure or business, we have a hotel that's right for you. This completely renovated hotel is the essence of classic luxury and modern convenience. Features include a pool and hot tub, Starbucks Café, onsite dining and an upscale lounge, a business center, 30,000 square feet of event space, delicious catering services and more. Get the 4-star experience at Hilton! Located across from Lambert International Airport and minutes from Downtown, Hilton offers newly renovated rooms in an ideal location. Enjoy amenities like 28,000 square feet of meeting space, a business center, pool, health club and more. We also offer an Internet Café, dining at Veranda’s and 24-hour airport shuttle service. This versatile hotel is ideal for everyone! Couples love our elegant accommodations, award-winning restaurant and relaxing whirlpool. Business guests appreciate wireless high-speed Internet, 12,200 square feet of event space and the business center. Families enjoy the pool and game room, as well as complimentary shuttle service. Conveniently located only 10 minutes from downtown St. Louis and steps away from the Gateway Convention Center, this first-class hotel offers superior service, deluxe accommodations and full-service conference and banquet facilities. Business and vacation travelers alike rate the Doubletree Collinsville/St. Louis as one of the best. Centrally located just one mile south of Forest Park, our beautifully appointed guest rooms provide quiet comfort in a beautiful setting. Hilton Garden Inn is central to the West St. Louis business district, with easy access to more than 40 restaurants and shopping. Amenities include a pool, fitness center, business center, meeting facilities and high-speed Internet access. Guests also enjoy the convenience of complimentary shuttle within 5 miles of the hotel. This first-class hotel in the St. Louis business district features comfortable accommodations, friendly service and amenities like onsite dining, a pool, fitness center and free shuttle service within 5 miles of the hotel. For business, wireless high-speed Internet, a business center and over 1,000 square feet of meeting space are available. 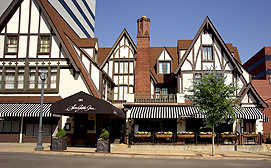 A unique boutique hotel in Clayton, MO nestled amid shops, art galleries and the area's finest eateries. Flat screen televisions are just one of the many amenities this charming hotel has to offer. Two great hotels, one great location. Sink into our new sweet sleeper beds. Right outside your room are several entertainment and restaurant venues all within walking distance.